In as much as the development of language is said to describe events of time due to the evolution of languages, and can supply us with accounts of how many languages appear, change, survive or perish, is time and number actually being indicated or are we humans imposing our views that help us justify aligning information according to some preferred notion of time, place, people and the like? If there were no humans to communicate perceived differences, would any change nonetheless describe time and number, but it is human perception and not time nor number which are changing? Is our value of time and number actually quite valueless because we are using our moment in history as a point of demarcation? While the history of writing is said to have originated from "picture signs", why do the processes found in nature not evolve beyond activities we humans frequently illustrate with pictures? For example, do biological, chemical or atomic particle processes occur numerically with time differentiation in a language humans can only describe with pictures... including the rather crude images of mathematics? Whereas we humans may claim that our earlier feeble attempts at expressing fundamental processes have evolved over time in order to paint or sculpt a clearer portrait why hasn't the processes themselves.. likewise evolved towards a (presumed) "better" self expression which would enable humans a greater clarity, unless (1) humans don't actually count in some greater scheme of existence, (2) the processes are one or more species whose evolutionary trek does not involve an enhanced development of self expression due to primivity born of isolation (or prejudice), or environmental constraint or (3) human concepts of time and number are naive concepts? If we say that words, numbers and letters have evolved over time, not to mention biology... the planet... and the universe, is the obverse just as true"? That is to say, does time also evolve in concert with the varying practices/events of evolution regardless of subject matter? In any respect, though we may at one point want to shoehorn a disclaimer as some would-be protection from those who might want to take issue with one or another point of our foray into the phenomena described as time; those of us intrigued by the concept of time must make his or her own way along this journey ... to see things for ourselves, or simply adopt the view of another whose status in some filed assures us of some accuracy because we are too insecure to venture forth on our own. So what are you afraid of? Why can't you think about time (or anything else for that matter) on your own without resorting to adopting the view of some accepted authority figure in a given academic field? Are you afraid of making a mistake or perceived to be foolishly extravagant in your creative thinking... much less tried some tightrope of an original idea? Many of us are tired of the dead ends, detours and distractions leading us to purchasing a book from those claiming some authority that generally lead most into antlion-like pits where many can no longer think for themselves and must reach for someone else's perception as the definitive source. Yet, let us be fully aware that there are many values of perception which accompany the concept of time— such as wondering whether it has dimension or if it is regulated by a certain type of dimension or other as yet nameless aspect of reality. For example, where does the concept of time lay amongst the fundamental forces of nature as described by physicists? Is time a fundamental force of Nature in and of itself, or merely a consequence of one or more of the presently defined fundamental forces which may or may not bespeak of an as yet unidentified single unifying principle called the "Grand Unifying Theory" (GUT) or "Theory of Everything" (TOE) or some other idea with an as yet undescribed physical body part abbreviation such as (EAR) or (EYE)? In mathematics and physics one also considers higher-dimensional spaces, such as four-dimensional space-time, where four numbers are needed to characterize a point: three to fix a point in space and one to fix the time. Source: "Dimension." Encyclopædia Britannica Ultimate Reference Suite, 2013. Note: Using the phrase "three to fix a point in space and one to fix the time" is a 3-to-1 ratio to be distinguished from a "4" or "four" reference. Making the distinction will help identify another relativity point of perception. For example, it can help us to identify the recurrence of the pattern such that this 3/1 ratio exhibits itself in how we count numbers as well such that after every third place we use a comma to distinguish that the fourth position begins a separate set such as thousands, millions, billions, etc... And apparently, most people hold one pen or pencil with three fingers. We can also find this in sports such as the three numbered bases (1st, 2nd, 3rd) and unnumbered Home base or plate. An example from American styled football is the first three downs are typically run or pass options, with the 4th down often used to punt the ball, though a team might run or pass the ball, the latter being frequently referenced as a Hail Mary pass... or long shot gamble. This same 3/1 partitioning effect takes place in DNA and RNA in that both have adenosine-cytosine-guanine, while they are distinguished respectively separated by Thymine and Uracil. 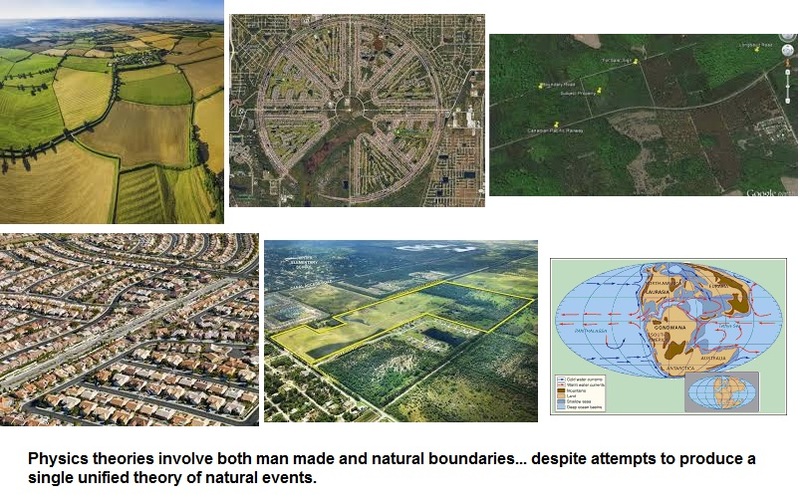 Note: a recurring pattern suggests the framework of a mindset which keeps us from traversing those ideas which further keep us from understanding perceptions in different patterns, since the patterns being used may be part of a survival adaptation in a deteriorating planetary environment with particular equilibrium requirements. In other words, we either fail to think outside a box or that the exterior is but another onion skin layer of the same box... and we are an insect that has set up housekeeping on a particular layer in a particular spot... sometimes referred to as one's niche. (It is) the combination of two theories of particle physics into a single framework to describe all interactions of subatomic particles, except those due to gravity. The two components of the standard model are electroweak theory, which describes interactions via the electromagnetic and weak forces, and quantum chromodynamics, the theory of the strong nuclear force. Both these theories are gauge field theories, which describe the interactions between particles in terms of the exchange of intermediary "messenger" particles that have one unit of intrinsic angular momentum, or spin. 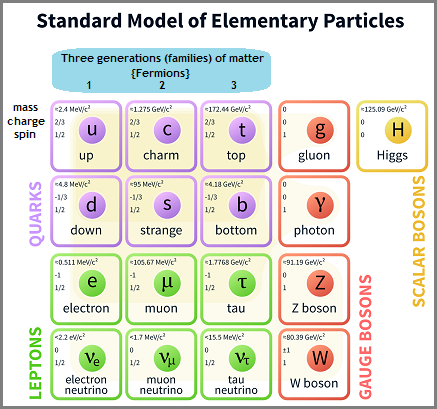 In addition to these force-carrying particles, the standard model encompasses two families of subatomic particles that build up matter and that have spins of one-half unit. These particles are the quarks and the leptons, and there are six varieties, or "flavours," of each, related in pairs in three "generations" of increasing mass. Everyday matter is built from the members of the lightest generation: the "up" and "down" quarks that make up the protons and neutrons of atomic nuclei; the electron that orbits within atoms and participates in binding atoms together to make molecules and more complex structures; and the electron-neutrino that plays a role in radioactivity and so influences the stability of matter. Heavier types of quark and lepton have been discovered in studies of high-energy particle interactions, both at scientific laboratories with particle accelerators and in the natural reactions of high-energy cosmic-ray particles in the atmosphere. The standard model has proved a highly successful framework for predicting the interactions of quarks and leptons with great accuracy. Yet it has a number of weaknesses that lead physicists to search for a more complete theory of subatomic particles and their interactions. The present standard model, for example, cannot explain why there are three generations of quarks and leptons. It makes no predictions of the masses of the quarks and the leptons nor of the strengths of the various interactions. Physicists hope that, by probing the standard model in detail and making highly accurate measurements, they will discover some way in which the model begins to break down and thereby find a more complete theory. This may prove to be what is known as a grand unified theory, which uses a single theoretical structure to describe the strong, weak, and electromagnetic forces. Source: "Standard Model." Encyclopædia Britannica. Because magnetism plays a huge role in particle physics and we place particles at the core of our ideas concerning space to which is applied the concept of time, one might venture to consider that time is not possible without magnetism. While there may be non-magnetic moments occurring amidst magnetically active ones, time... like gravity... may involve magnetism and thus magnetic fields and electric current. Unless of course one might conceive of an existence where magnetism does not exist but time does. For example, if magnetic events occur within a vacuum, does the vacuum thus have time, or is it an absence of time within which an event of time can occur? Is the absence of time a sort of anti-time or neutral time? If we consider there are two forms of time, could there be more, yet not an unlimited more? The Gravitational force is odd-man out in the Standard Model, making this a 3-to-1 ratio assessment and not "four" forces... so to speak. 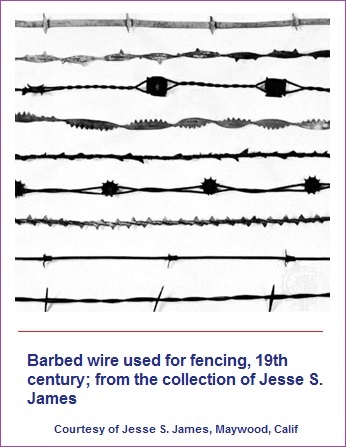 It may also be helpful for some readers to use the phrase "range field theory" (or hacienda, estate, land grant, etc...) instead of "gauge field theory", such that one might think in terms of cattle range/ranch property-line boundaries marked without easily visible fences... but there are indications of barbed wire being used in some areas of research because of sticky entanglements. Gauge theories are said to deal with subatomic particles and their wave fields, in as much as ranchers are concerned with live-stock and where they like to roam for feeding... but having artificialized times and places which are often set to schedules. Resource quantities to be found within such property boundaries are called Scalar (such as volume, density, speed, energy, mass, and time), and other resources describing such qualities as force and velocity have both magnitude and direction (like a large precious mineral deposit or water source heading northward) and are referred to as Vectors. [ "Scalar." Encyclopædia Britannica, 2013.] In using the phrase "range field theory", Physicists might thus be described as cow-boys/cow-girls or all-around ranch hands... with a few claiming some property rights and leaving their personal brand on a particular product... with or without being recognized by the Nobel Prize committee. 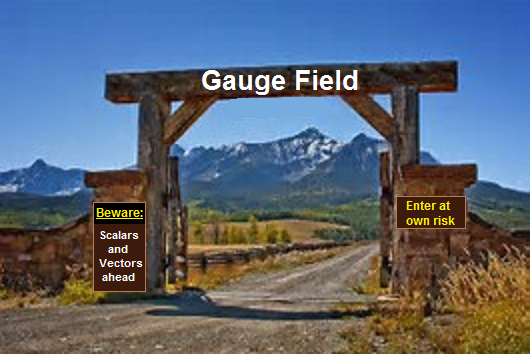 Others are drovers, fence menders, cooks, blacksmiths, branders, scouts, etc... "Scalar, Vectors and Gauge field theory" are part of specialized vernacular employed by the rootin', tootin' and shootin' physics and mathematics townsfolk. The four forces are often described according to their relative strengths. The strong force is regarded as the most powerful force in nature. It is followed in descending order by the electromagnetic, weak, and gravitational forces. Despite its strength, the strong force does not manifest itself in the macroscopic universe because of its extremely limited range. It is confined to an operating distance of about 10-15 metre—about the diameter of a proton. When two particles that are sensitive to the strong force pass within this distance, the probability that they will interact is high. The range of the weak force is even shorter. Particles affected by this force must pass within 10-17 metre of one another to interact, and the probability that they will do so is low even at that distance unless the particles have high energies. By contrast, the gravitational and electromagnetic forces operate at an infinite range. That is to say, gravity acts between all objects of the universe, no matter how far apart they are, and an electromagnetic wave, such as the light from a distant star, travels undiminished through space until it encounters some particle capable of absorbing it. Source: "Fundamental interaction." Encyclopædia Britannica ultimate Reference Suite, 2013. Is time headed along a definitive course and can that course be altered and manipulated at Will? What might be the best analogy in describing or illustrating time? 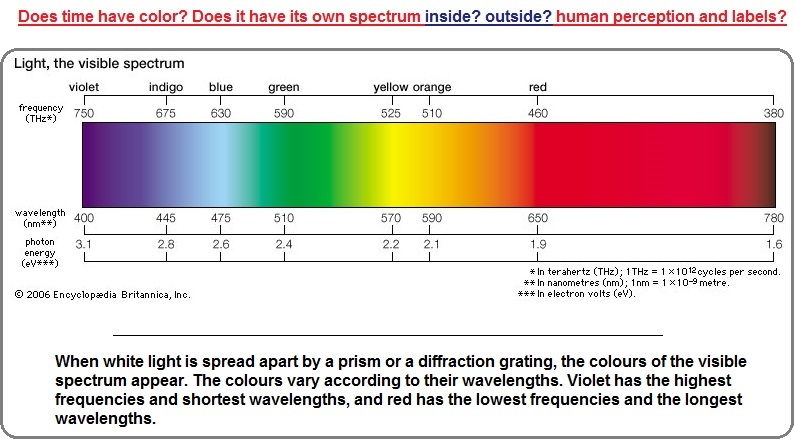 For example, do we use the sounds of music time, the dimensions of art, or the colors of the visible spectrum? It may not be possible to conceive of time in other than the way we presently do, unless we adopt it to alternative models such as the electromagnetic spectrum. Is the present concept of time merely a slice or small proportion of a larger spectrum of time or time-related phenomena? Does time have an odor, pleasant or otherwise (such as a memorable event initiated by the scent of a particular food, perfume or body odor), and can this time thus be detected from a long way off by humans whose sense of time is like the scent of a flower filled with nectar? Are our minds instinctively "programmed" to produce the same or similar cognitive dances in order to communicate a direction towards time like the dances of honeybees when indicating where nectar can be found? Is time best described as a chameleon type of lizard in that many different types of analogy can be used to describe its characteristics, but never a raw, naked self? For example, is time best described as a life form or some developmental characteristic thereof such as the three Germ layers, or overall simplistic division such as having a head, thorax and abdomen? Does time have a consciousness? Does time perceive and have self-mobilization? 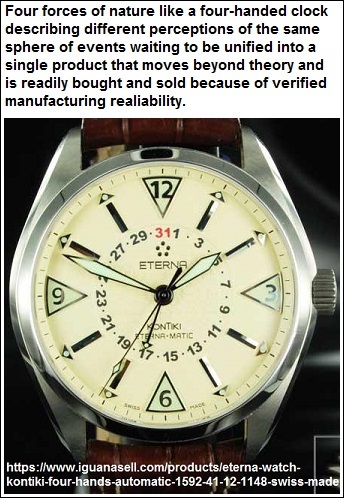 Or is time better viewed in an inanimate sense, like the parts of an analog or digital clock? Does time have both energy and mass? Is time a mechanism with or without some biological characteristics? Like the chicken/egg or particle/wave ideas, is time of a simple/complex light/dark configuration? Do we let some physics, psychology or philosophy standard of time dictate our measurement thereof? Do we let some cultural, chemistry or causal standard of time dictate our measurement thereof? Is a study of time of great importance or merely a distraction? However, there may be a recurring frequency for some readers to encounter the notion of time being an arrow... that is, having a start to finish orientation, or is this little more than a reference to our understanding of time with respect to the life and death sequence of biological states on a planet that is itself heading along a demise in an incremental fashion? ...A demise that began the moment it originated, and that the processes which stimulated the growth of what we call life, is part of the decay... and our human belief systems are little more than coping mechanisms alternatively described as adaptation or rationalized adjustments in an attempt to maintain some semblance of equilibrium as the disintegration continues? Does time have three arrows, three (roundish?) targets, or a moving (dynamic) rather than a stationary (static) target? Perhaps for some readers it is more important to ask whether time has a definitive target (destiny), if we pursue the time-is-an-arrow perspective? Indeed, does time have a target, and does that (pretend) target represent but a practice session for yet one or more other "real" targets that may or may not have anything to do with human or all of biological existence? Is it appropriate to assign a "personhood" to time even though the U.S. Supreme Court foolishly permitted businesses to acquire this attribute in order to protect business officers from any wrong doing if they were to simply cite that it was the business which made a mistake or committed a fault and not any one person... because finding fault with an entire group would leave open the door for the public to be able to convict the entire Congress, White house, Pentagon, S.E.C. Supreme Court, CIA, FBI, NSA, etc., for a collectively executed legalized or moralized incongruity? In other words, the Supreme Court provided businesses with a politically generated and legal scapegoat. Is time a self contained individual entity or is it an emergent property of one or more other events? Does space need to be measured by time? Hence, does time need space but space doesn't need time? If we say that space can exist without time, then there may be (portions of) space without time and vice versa. Can thought exist without time, or is thought a process of decay, just as our ideas and behaviour are altered over time due to decay, and thus constitute a commonly accepted reference to time? 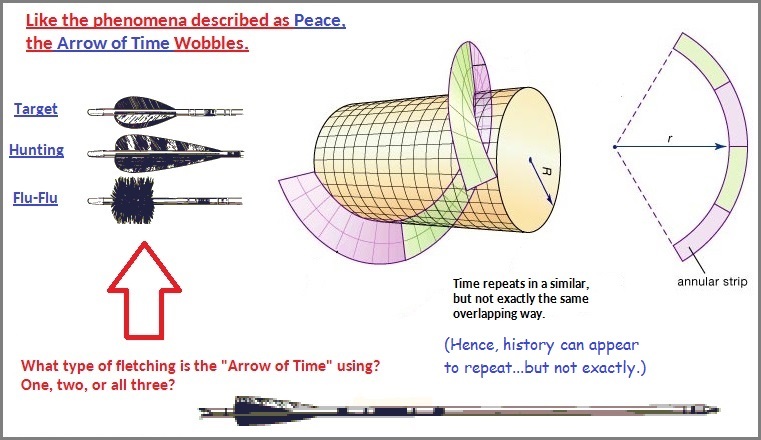 However, the usage of the word "wobble" might not be used by those who are accustomed to referring to the flight of an arrow which they may describe as flying "straight and true", with any "wobbling" affect discounted as a negligible consideration since the desired target was hit. If anyone has shot an arrow without feathers will quickly surmise, there is indeed a lot of wobbling and it is only in slow motion images of an arrow's flight in a motion picture which may give a viewer any indication of a spinning arrow... or not. The fletching of arrows provides a similar effect to that which is called "Rifling" in firearm types of weapons, from pistols to rifles to cannons. Time may be subject to either/or its own type of fletching or rifling... if one can perceive of light, magnetism or other phenomena as occurring (sometimes? all times?) as a hollow tube (that may or may not be subject to external or internal forces which cause the tube to distort... that some may refer to as the warping of space). Then again, we are confronted with the question of whether time, space and dimension are directed along individual (unidirectional) courses or are they omni-directional? If we can have different time zones on Earth, surely there may be different time zones in space that may or may not be independent of any presumed singular time count. In other words, there is no Universal time for all of existence just as one might presume that the seasons of Earth are nonetheless subjected to a larger time relevance with respect to events taking place in the larger solar system or galaxy? The zeroth law of thermodynamics. When two systems are each in thermal equilibrium with a third system, the first two systems are in thermal equilibrium with each other. This property makes it meaningful to use thermometers as the "third system" and to define a temperature scale. The first law of thermodynamics, or the law of conservation of energy. The change in a system's internal energy is equal to the difference between heat added to the system from its surroundings and work done by the system on its surroundings. The second law of thermodynamics. Heat does not flow spontaneously from a colder region to a hotter region, or, equivalently, heat at a given temperature cannot be converted entirely into work. Consequently, the entropy of a closed system, or heat energy per unit temperature, increases over time toward some maximum value. Thus, all closed systems tend toward an equilibrium state in which entropy is at a maximum and no energy is available to do useful work. This asymmetry between forward and backward processes gives rise to what is known as the "arrow of time." The third law of thermodynamics. The entropy of a perfect crystal of an element in its most stable form tends to zero as the temperature approaches absolute zero. This allows an absolute scale for entropy to be established that, from a statistical point of view, determines the degree of randomness or disorder in a system. Source: "Thermodynamics." Encyclopædia Britannica Ultimate Reference Suite, 2013.
of one or more related ideas.